Stopped into the repair shop and found our technician, Rachel, working on an overhaul. 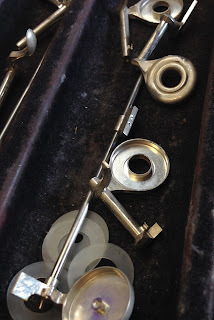 As usual, she had a tray full of keys and mechanism components, including some round, rubbery discs that we hadn't noticed before. So, we had to ask -- "What are these?" Well, Rachel explained that they are "base shims." They are used at the bottom of the cup, underneath the shims and pad. These base shims are used with Straubinger pads, because Straubinger pads are much more compact and take up less space in the cup. The base shim helps take up the extra space so that the builders and repair technicians do not have to put an over-abundance of shims in the cup to raise the pad to the correct position. 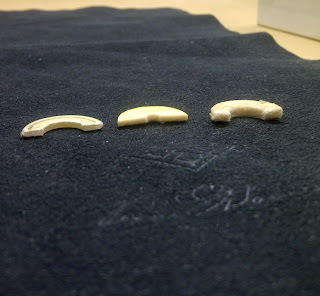 Rachel added, "One thick piece of material is much more stable than many thin pieces." Certainly makes sense to us! Taking a closer look at the base shims, we noticed two types. One type is a rubbery plastic that is somewhat translucent. It is used in cups that are flat on the inside. The other type of shim is made from a harder plastic and has "rings" that interlock with the ringed surface of the bottom of cups with a "rings." The top of the "ringed" shim, however, is flat so that shims and pads can sit properly. Rachel also told us that base shims have been made out of different materials over the years. 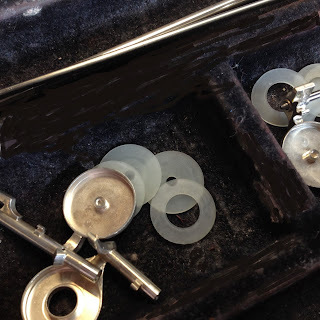 How long have flute makers been using base shims? Well, it's a bit difficult to pinpoint exactly, but for many years, flute makers used felt pads. The felt pads are "fluffier" and take up much more space in the cup, so they do not need a base. Felt pads may be made from either woven felt or pressed felt. The Straubinger pad is made from microfiber, so it is much thinner in comparison with the felt pads. Rachel mentioned that there are many types of pads available now, and many will use a base shim because they are much more thin or "compressed" than older felt pads. Base shims are pretty sturdy, so in terms of "repair or replace," they generally would not to be repaired or replaced -- they are just part of the pad-fitting process. Pads left to right: Straubinger, pressed felt, woven felt. Rubbery plastic base shims for cups that are flat on the bottom. Cups with "rings" inside take a different base shim. Harder plastic base shim for cups with "rings" inside. Base shim's "rings" interlock with cup, and flat side is up.